This form is a real estate purchase contract for a build to suit large distribution center that will be occupied by a single user following completion of the improvements. The purchaser was previously a tenant in the seller's development, but is now purchasing a new distribution center facility built by its former landlord. This purchase agreement has a series of exhibits that refer to the plans and specifications of the the new improvements to be constructed by the seller. Note that the purchase under the agreement is subject to the seller's acquisition of the parcel, which the seller does not yet own. The seller is responsible for the base building improvements and building shell, and for the first $600,000 of the cost of the tenant improvements for the facility (with the buyer to pay any excess). (d) any intangible personal property now or hereafter owned by Seller and used in the ownership, use or operation of the Real Property, including, without limitation, Seller's rights and interests in any utility contracts (excluding any utility deposits made by Seller) or other agreements or rights relating to the ownership, use and operation of the Real Property (except that, (i) to the extent that any such contracts or other agreements are part of portfolio agreements, they shall not be assignable, and (ii) Seller hereby retains all rights to any and all copyrights, trademarks, logos, graphics and other rights with respect to the name “ _________ ”, including the name “ _________ ”), and any construction warranties relating to the Improvements (collectively, the “ Intangible Property ”). (a) The purchase price of the Property is ________________________ Dollars ($________) (the “ Purchase Price ”). (i) Within three (3) days after full execution of this Agreement, Buyer shall deposit in escrow with ____________ Title Company at ____________________ (the “ Title Company ”) an all cash payment, or wire transfer, in the amount of ___________________Dollars ($___________) (the “ Deposit ”). Except as otherwise provided in this Agreement, the Deposit shall not be refundable to Buyer. The Deposit shall be held in an interest bearing account and all interest thereon shall be deemed a part of the Deposit. At the Closing, as defined in Section 1.2(b)(iii) below, the Deposit shall be paid to Seller and credited against the Purchase Price. (ii) IF THE SALE OF THE PROPERTY IS NOT CONSUMMATED DUE TO THE FAILURE OF ANY CONDITION PRECEDENT AND THE BUYER IS NOT THEN IN DEFAULT, THEN THE TITLE COMPANY SHALL RETURN THE DEPOSIT TO BUYER. IF THE SALE OF THE PROPERTY IS NOT CONSUMMATED SOLELY DUE TO THE SELLER'S DEFAULT HEREUNDER, THEN, AS BUYER'S SOLE AND EXCLUSIVE REMEDIES, BUYER MAY EITHER: (1) TERMINATE THIS AGREEMENT AND RECEIVE A REFUND OF THE DEPOSIT, IN WHICH EVENT NEITHER PARTY SHALL HAVE ANY FURTHER RIGHTS OR OBLIGATIONS HEREUNDER (EXCEPT AS PROVIDED IN SECTIONS 7.1, 9.3 AND 9.12 BELOW), OR (2) ENFORCE SPECIFIC PERFORMANCE OF THIS AGREEMENT; PROVIDED, HOWEVER, IF THE ACTIONS OF SELLER HAVE RENDERED SPECIFIC PERFORMANCE IMPOSSIBLE TO ACHIEVE, BUYER MAY SEEK TO RECOVER ITS ACTUAL DAMAGES DUE TO SELLER'S DEFAULT HEREUNDER. THE PARTIES HAVE AGREED THAT SELLER'S ACTUAL DAMAGES IN THE EVENT OF A FAILURE TO CONSUMMATE THE SALE DUE TO BUYER'S DEFAULT WOULD BE EXTREMELY DIFFICULT OR IMPRACTICABLE TO DETERMINE. AFTER NEGOTIATION, THE PARTIES HAVE AGREED THAT, CONSIDERING ALL THE CIRCUMSTANCES EXISTING ON THE DATE OF THIS AGREEMENT, THE AMOUNT OF THE DEPOSIT IS A REASONABLE ESTIMATE OF THE DAMAGES THAT SELLER WOULD INCUR IN THE EVENT OF BUYER'S DEFAULT. IN THE EVENT BUYER FAILS, WITHOUT LEGAL EXCUSE, TO COMPLETE THE PURCHASE OF THE PROPERTY, THE DEPOSIT MADE BY BUYER SHALL BE FORFEITED TO SELLER AS THE SOLE AND EXCLUSIVE REMEDY AVAILABLE TO SELLER FOR SUCH FAILURE. BY PLACING THEIR INITIALS BELOW, EACH PARTY SPECIFICALLY CONFIRMS THE ACCURACY OF THE STATEMENTS MADE ABOVE AND THE FACT THAT EACH PARTY WAS REPRESENTED BY COUNSEL WHO EXPLAINED, AT THE TIME THIS AGREEMENT WAS MADE, THE CONSEQUENCES OF THIS LIQUIDATED DAMAGES PROVISION. THIS SECTION 1.2(b)(ii) IS NOT INTENDED TO LIMIT SELLER'S OR BUYER'S RIGHTS UNDER SECTIONS 7.1, 9.3 AND 9.12 OF THIS AGREEMENT. (iii) The balance of the Purchase Price (plus the construction costs of the Improvements attributable to any Change Orders (as defined below) requested by Buyer pursuant to Section 2.2 below that has not already been paid to Seller under the terms of this Agreement) shall be paid to Seller in immediately available funds via wire transfer at the consummation of the purchase and sale contemplated hereunder (the “ Closing ”). Section 2.1 Limited Title Review. (a) Buyer hereby acknowledges its receipt of the Pro Forma attached hereto as Schedule 1 (the “Pro Forma”), including, without limitation, the title exceptions set forth in the Pro Forma, and a copy of a current survey of the Property (the “ Survey ”), and Buyer hereby approves of the matters set forth on the Pro Forma and Survey, with the exceptions noted on the Pro Forma and Survey in Schedule 1 , subject to the obligation of Seller to cure, correct or eliminate certain items as noted on Schedule 1 (the “ Title Items ”). At any time during the course of construction of the Improvements (hereinafter defined) Buyer may request that the Title Company update the Pro Forma in the form of a title commitment (“ Title Commitment ”) and Buyer may obtain updates of the Survey, in order to verify that there have been no new title exceptions affecting the Property other than those approved by Buyer in the Pro Forma and Survey which it was initially provided or as otherwise permitted under this Agreement. (b) Subject to the provisions of Section 2.1(c) below, Buyer may, at or prior to Closing, notify Seller in writing of any objections to title first raised by the Title Company or first disclosed in any updates to the Pro Forma in the Title Commitment or the Survey obtained by the Buyer between (a) the Effective Date, and (b) the Closing, and which: (1) are not the result of Buyer's acts, (2) do not constitute exceptions which are disclosed in the Pro Forma or the Survey or any prior updates and (3) have a material adverse effect on the use or operation of the Property as a distribution facility. Buyer shall advise Seller of its additional title objections by written notice within three (3) business days of learning of any such additional title matters. Seller shall have until the earlier of (x) two (2) business days after receipt of Buyer's objections, or (y) the Closing Date, to give Buyer notice that (i) Seller will remove such objectionable exceptions; or (ii) Seller elects not to cause such exceptions to be removed. If Seller gives Buyer notice under clause (ii), Buyer may elect within two (2) business days after receipt of Seller's notice to (i) waive its objections to title exceptions that Seller has not agreed to remove and proceed with the purchase without offset or credit against the Purchase Price, or (ii) terminate this Agreement. If Seller fails to give Buyer notice within (x) two (2) business days after receipt of Buyer's objections, or (y) the Closing Date, whichever is earlier, then Seller shall be deemed to have elected to give Buyer notice under clause (ii). If Seller gives Buyer notice under clause (ii), and Buyer fails to give Seller notice of its election within two (2) business days after receipt of Seller's notice, then Buyer shall be deemed to have elected to terminate this Agreement, the Deposit shall be returned to Buyer and if the matter objected to by Buyer was the result of Seller's voluntary act occurring after the Effective Date and was not otherwise permitted under this Agreement, Seller shall pay to Buyer its actual out-of-pocket expenses incurred in connection with this transaction in an amount up to Two Hundred Fifty Thousand Dollars ($250,000) in the aggregate, and neither party shall have any further rights or obligations hereunder except as provided in Sections 7.1, 9.3 and 9.12 below. If Seller shall give notice pursuant to clause (i) and shall fail to remove any such objectionable exceptions, or if Seller shall fail to cure or eliminate any Title Items, then Buyer may elect to terminate this Agreement, the Deposit shall be returned to Buyer, Seller shall pay to Buyer for its actual out-of-pocket expenses incurred in connection with this transaction in an amount up to Two Hundred Fifty Thousand Dollars ($250,000) in the aggregate, and neither party shall have any further rights or obligations hereunder except as provided in Sections 7.1, 9.3 and 9.12 below. If Seller elects to attempt to cure any such additional title objections, the date for Closing shall be automatically extended until Seller completes the cure, but in no event shall the extension exceed thirty (30) days after the date for Closing set forth in Section 8.2 hereof unless a further extension is approved in writing by Buyer. (c) Notwithstanding the foregoing, Buyer acknowledges that prior to and after the Effective Date, with the prior written consent and approval of Buyer to any items which Seller determines may have a material adverse effect on Buyer's use or operation of the Property as a distribution facility, Seller may impose certain easements, assessments, conditions, covenants and restrictions, and other encumbrances on the Property with respect to the construction of the Improvements, the development of adjoining parcels, the retention of certain rights and the imposition of certain obligations with respect to common areas between the Property and adjoining parcels (collectively, the “ Development Encumbrances ”). Seller shall provide Buyer with a copy of any Development Encumbrances at least three (3) business days prior to recording the same and, if such Development Encumbrances will have a material adverse effect, as reasonably determined by Buyer, then Buyer shall have the right to approve such Development Encumbrances prior to recordation. If Buyer's approval is required, Buyer shall not unreasonably withhold, condition or delay its approval, and where Buyer does not provide notice of its approval or objection to a proposed Development Encumbrance within three (3) business days following notice of such proposed Development Encumbrance, it shall be deemed to have approved such Development Encumbrance. In addition, and notwithstanding the foregoing, the parties acknowledge that Seller shall pay all costs and expenses necessary to release any monetary lien secured by the Property prior to the Closing, and no such liens or claims shall be Conditions of Title (hereinafter defined) and Seller shall be entitled to use the Purchase Price proceeds to satisfy any such liens (provided that Seller shall be entitled to bond around any such liens if permitted under applicable law). All sums necessary to effectuate the release of any such monetary liens or claims may be paid by Buyer and offset against the Purchase Price. Notwithstanding the foregoing, as long as the Development Encumbrances do not have a material adverse effect on Buyer's use or operation of the Property as a distribution facility, Buyer shall not object to any Development Encumbrances (and shall not have any right to do so), and Seller shall have no obligation to cure any such Development Encumbrances. As used herein, “material adverse effect” shall be defined as any item which would unreasonably restrict normal and customary operations of a third-party prudent operator of the Property who would be in the same business as that of the Buyer. 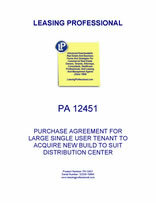 (a) Seller has caused to be prepared, at Seller's sole cost and expense, and Buyer has approved (i) that certain Base Building and Tenant Improvement Specifications dated _________ (" Specifications ") and attached hereto as Exhibit B-1 , (ii) that certain Site Plan prepared by _________ and dated _________ and attached hereto as Exhibit B-2 (“ Site Plan ”), (iii) those certain preliminary elevation drawings prepared by _________ and dated __________ and attached hereto as Exhibit B-3 (“ Elevation Plans ”), and (iv) the preliminary floor plan prepared by _________ and dated _________ attached hereto as Exhibit B-4 (the “ Floor Plan ”) (items (i) and (iv) as they pertain to the tenant improvements to be constructed in the interior of the Building, being herein collectively referred to as the “ Preliminary Tenant Improvement Plans ”). The improvements to be constructed by Seller pursuant to the Submitted Building Shell Plans (as defined in subparagraph (b) below) (herein, the “ Building Shell ”) and pursuant to the Preliminary Tenant Improvement Plans (herein, the “ Tenant Improvements ”), are herein collectively referred to as the " Improvements ". (b) Seller has prepared, and Buyer has approved, plans and specifications which have been submitted to the City of _________ (“ City ”) in connection with the issuance of the building permit for the construction of the Building Shell, which such submitted plans and specifications are shown in Exhibit B-5 (the “ Submitted Building Shell Plans ”). If the City requires any material or substantial modifications to the Submitted Building Shell Plans, Seller shall provide written notice of such modifications to Buyer for its review, and with respect to any material modifications, for its consent and approval, which consent and approval shall not be unreasonably withheld or delayed. If Buyer does not approve any material modifications to the Submitted Building Shell Plans required by the City, Buyer may elect to terminate this Agreement, in which event the Deposit shall be returned to Buyer, and neither party shall have any further rights or obligations hereunder except as provided in Section 7.1, 9.3 and 9.12 below; provided, however, to the extent such modifications (i) are required as a result of Buyer Delays (as defined in Section 2.2(i) below) or (ii) are consistent with the Specifications, Buyer shall have no right to approve of such modifications or to terminate this Agreement. If Buyer fails to approve or disapprove any such material modifications within three (3) business days after its receipt thereof, then Buyer shall be deemed to have approved such material modifications. Upon review and approval of the Submitted Building Shell Plans, together with any amendments, by the City (as modified to incorporate any modifications to the Submitted Building Shell Plans which are required by the City), the Submitted Building Shell Plans shall be deemed the “ Final Building Shell Plans ”. For avoidance of doubt, the Building shall be built in accordance with the Final Building Shell Plans and the Specifications (and, in the event of a conflict between the Final Building Shell Plans and the Specifications, the Specifications shall control). 5(c) Any changes to the Final Building Shell Plans requested by Buyer (herein referred to as a "Change Order ") shall be submitted only by ____________ to Seller in writing and shall be at Buyer's sole cost and expense and subject to Seller's written approval, which approval shall not be unreasonably withheld, conditioned or delayed. Any Change Order that increases the office square footage, increases the amount of Building equipment, or increases the scope of construction as specifically detailed in the Final Building Shell Plans, shall result in specific costs which shall be paid by Buyer to Seller at Closing or the earlier termination of this Agreement (other than as a result of Seller's default). Buyer may by Change Order replace the materials called for in the Final Building Shell Plans with comparable materials, or with materials of a higher grade, but Buyer shall have no right to change the materials to materials which, in Seller's reasonable opinion, are of an inferior grade or quality to those called for in the Final Building Shell Plans. Notwithstanding anything to the contrary contained herein, at Seller's request, Buyer shall deposit ten percent (10%) of the cost of each Change Order up to the first Four Hundred Thousand Dollars ($400,000) of all such Change Orders and fifty percent (50%) of the cost of all Change Orders after the first Four Hundred Thousand Dollars ($400,000) of all such Change Orders, in escrow with the Title Company (the “ Change Order Deposit ”) within fifteen (15) days after Seller's request therefor and as a condition to implementation of the applicable Change Order(s). Any such Change Order Deposit made as required hereunder shall be subject to escrow instructions reasonably satisfactory to Seller, Buyer and the Title Company, and shall provide that such Change Order Deposit shall be paid to Seller at Closing (and shall not be credited against the Purchase Price), or returned to Buyer if Buyer is entitled to a return of the Deposit hereunder. (e) Seller shall cause the Building Shell to be constructed at Seller's sole cost and expense (except as otherwise provided in this Agreement), in a good and workmanlike manner, in substantial and material compliance with the Final Building Shell Plans, and in compliance with all applicable building codes and regulations of the City. Seller shall complete the Building Shell in a timely manner in substantial accordance with the construction schedule for the Building Shell attached hereto as Exhibit B-6 (“ Construction Schedule ”), subject only to Buyer Delays (hereinafter defined) and Unavoidable Delays (hereinafter defined) and in all events, on or before __________ (the “ Outside Completion Date ”). For each day elapsing between the Outside Completion Date (as such date may be extended pursuant to the provisions of Section 6.2) and the Substantial Completion of the Improvements, the Buyer shall receive a credit against the Purchase Price in an amount of Two Thousand Five Hundred Dollars ($2,500) per day, with the understanding, however, that there shall be no such credit to the Purchase Price for delays in Substantial Completion due to Buyer Delays or Unavoidable Delays. Any credit against the Purchase Price received by Buyer pursuant to the foregoing sentence shall in no event exceed Two Hundred Fifty Thousand Dollars ($250,000). At such time as Buyer's credit pursuant to this Section 2.2(e) would exceed Two Hundred Fifty Thousand Dollars ($250,000) (but for the foregoing limitation), then Buyer may elect to terminate this Agreement upon written notice to Seller in which event this Agreement shall terminate and the Deposit shall be returned to Buyer (and neither party shall have any further liability to the other) unless Seller agrees within ten (10) days after receipt of such termination notice to allow the $2,500 per day credit to continue above $250,000 until Substantial Completion is actually achieved. Buyer shall have no obligation for construction costs attributable to the Building Shell except for any Change Orders. Seller shall cause the Tenant Improvements to be constructed in a good and workmanlike manner, in substantial accordance with the Final Tenant Improvement Plans, and in accordance with all applicable building codes and requirements of the City. Seller shall pay the first Six Hundred Thousand Dollars ($600,000) of the construction costs attributable to the Tenant Improvements (collectively, the “ Tenant Improvements Construction Costs ”) and Buyer shall be responsible for the balance of the Tenant Improvements Construction Cost; provided, however, prior to commencement of the Tenant Improvements, Seller shall provide to Buyer a cost estimate providing the maximum cost of the Tenant Improvements (the “ Maximum Tenant Improvement Cost Estimate ”) for its prior written approval. Seller shall be responsible for any costs of the Tenant Improvements in excess of the Maximum Tenant Improvement Cost Estimate, unless such increase(s) are due to (i) Change Orders required by the Buyer or documented due to Buyer Delay or (ii) Unavoidable Delays (as defined herein). The Improvements shall be designed by _________ and constructed by a general contractor selected by Seller, subject to the prior written approval of Buyer, which approval shall not be unreasonably withheld, conditioned or delayed. If Buyer fails to approve the general contractor selected by Seller within three (3) business days after its receipt of notice of the general contractor selected by Seller, then Buyer shall be deemed to have approved such general contractor. If required by Buyer, Seller shall submit the Improvements, or applicable portions thereof, for competitive bidding. Seller shall cause the Improvements to be constructed substantially in accordance with the Final Plans and in accordance with the terms and conditions of this Agreement. Seller shall make no changes to the Final Plans without Buyer's prior written consent, with the exception of immaterial details which will not affect Buyer's use and occupancy of the Building and the other Improvements. In the event Seller should make any modifications to the Final Plans without Buyer's prior written consent in accordance with the preceding sentence, Seller shall promptly advise Buyer of the changes which were made. Seller shall have the Final Plans sealed by the architect, obtain all required building permits, certificates and licenses necessary to occupy the Building (other than business licenses attributable to Buyer's business to be operated in the Building) and thereafter, in accordance with all applicable law and insurance requirements, cause the construction of the Improvements to be carried out in a diligent and good workmanlike manner, subject to any Buyer Delays. Seller shall pay and discharge all liens applicable to the construction of the Improvements, at its sole cost and expense, and payment of all such liens or lien claims shall be a condition to Buyer's obligation to purchase the Property, and Buyer hereby acknowledges that Seller may use the Purchase Price proceeds to satisfy such liens and claims (provided that Seller shall be entitled to bond around any such liens if permitted under applicable law). As used herein, “Unavoidable Delays” shall mean an act of God, fire, earthquake, flood, explosion, war, insurrection, riot, mob violence, sabotage, inability to procure labor, equipment, facilities, materials or supplies, strikes, walk-outs, action of labor unions, condemnation, laws, litigation involving a party, inability to obtain governmental permits or approvals, unusually inclement weather, and other matters not within the control of the party in question.